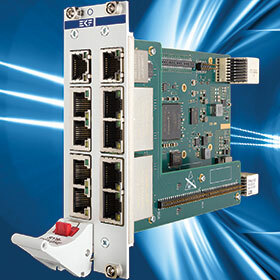 Pentek’s SY8-Cyclone is a CompactPCI Serial peripheral board, equipped with a powerful FPGA and up to 10 RJ45 connectors for 100BASE-TX Ethernet. With its PCI Express x4 interface, the Cyclone-V FPGA can be used, for example, as an Ethernet NIC, switch, router or gateway. Industrial Ethernet real-time protocols and custom specific applications may be integrated. The board provides five RJ45 connectors in 4HP front panel width, or optionally 10 ports in 8HP width. As an additional option, it can accommodate a mezzanine module with a secondary, identical FPGA. This would allow for either safety critical applications by redundancy, or additional logic elements for custom specific solutions. The Intel (formerly Altera) 5CGXFC7C6F23I7N Cyclone-V FPGA operates over the industrial temperature range and contains 150K logic elements, and also hard IPs for the PCI Express controller. In addition to non-volatile I²C memory, 512 MB DDR3L soldered RAM is wired on-board to the Cyclone-V FPGA. A reference design based on Quartus is available as a starting point for customers.